The Vedas are a large body of texts containing hymns, poems, and ceremonial formulas originating in Ancient India. They form the oldest layer of Sanskrit literature and the oldest sacred texts of Hinduism. There are four Vedas, the Rig Veda, Sama Veda, Yajur Veda and Atharva Veda. The Vedas are the primary texts of Hinduism. They also had a vast influence on Buddhism, Jainism, and Sikhism. 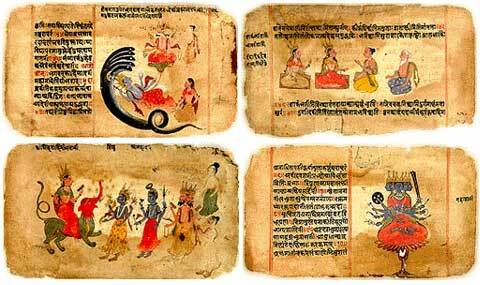 Initially the Vedas were considered so sacred that they were only transmitted orally from one generation to the next spanning 100,000 years. They came to us in written form between 4-6,000 years ago. According to Hindu tradition, the Vedas are 'not of human agency', having been directly revealed, and thus are called sruti ('what is heard'). Vedic mantras are recited at Hindu prayers, religious functions and other auspicious occasions. The mystic dimensions and applications of these mantras as a way of obtaining the physical immortality was elaborated in Sri Aurobindo's, The Secret of the Veda. The Rig-Veda Samhita is the oldest significant extant Indian text. It is a collection of 1,028 Vedic Sanskrit hymns and 10,600 verses in all, organized into ten books (Sanskrit: mandalas). The hymns are dedicated to Rigvedic deities. The books were composed by sages and poets from different priestly groups over a period of at least 500 years, which Avari dates as 1400 BCE to 900 BCE, if not earlier According to Max Müller, based on internal evidence (philological and linguistic), the Rigveda was composed roughly between 1700-1100 BCE (the early Vedic period) in the Punjab (Sapta Sindhu) region of the Indian subcontinent. Michael Witzel believes that the Rig Veda must have been composed more or less in the period 1450-1350 BCE. There are strong linguistic and cultural similarities between the Rigveda and the early Iranian Avesta, deriving from the Proto-Indo-Iranian times, often associated with the Andronovo culture; the earliest horse-drawn chariots were found at Andronovo sites in the Sintashta-Petrovka cultural area near the Ural mountains and date to ca. 2000 BCE. The Yajur-Veda ('Veda of sacrificial formulas') consists of archaic prose mantras and also in part of verses borrowed from the Rig-Veda. Its purpose was practical, in that each mantra must accompany an action in sacrifice but, unlike the Sama-Veda, it was compiled to apply to all sacrificial rites, not merely the Soma offering. There are two major recensions of this Veda known as the 'Black' and 'White' Yajur-Veda. The origin and meaning of these designations are not very clear. The White Yajur-Veda contains only the verses and sayings necessary for the sacrifice, while explanations exist in a separate Brahmana work. It differs widely from the Black Yajurveda, which incorporates such explanations in the work itself, often immediately following the verses. Of the Black Yajurveda four major recensions survive, all showing by and large the same arrangement, but differing in many other respects, notably in the individual discussion of the rituals but also in matters of phonology and accent. The Sama-Veda is the 'Veda of chants' or 'Knowledge of melodies'. The name of this Veda is from the Sanskrit word saman which means a metrical hymn or song of praise. It consists of 1549 stanzas, taken entirely (except 78) from the Rig-Veda. Some of the Rig-Veda verses are repeated more than once. Including repetitions, there are a total of 1875 verses numbered in the Sama-Veda recension published by Griffith. Two major recensions remain today, the Kauthuma/Ranayaniya and the Jaiminiya. P> Its purpose was liturgical and practical, to serve as a songbook for the 'singer' priests who took part in the liturgy. A priest who sings hymns from the Sama-Veda during a ritual is called an udgat, a word derived from the Sanskrit root ud-gai ('to sing' or 'to chant'). A similar word in English might be 'cantor'. The styles of chanting are important to the liturgical use of the verses. The hymns were to be sung according to certain fixed melodies; hence the name of the collection.